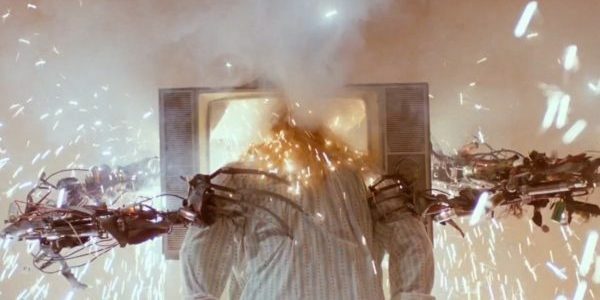 This one is indicative of the movie itself – amazing practical effects and creative visual ideas marred by the goofball comedian Freddy had become at this point in the series. If it wasn’t for his incessant interjections such as “don’t dream and drive!” and “fuel injection!”, this might rank a little higher. Yet the influence of David Cronenberg’s bio-mechanical body horror is clear and effective (something that comes into play with #4 and #3 too), as Dan is subsumed by the motorcycle he’s driving, cables plunging into his body. It also works within the narrative of the real world – Dan is really just falling asleep at the wheel of his truck, setting up the tragedy of the aspirational youth who made a fatal mistake on the eve of his graduation. While this isn’t one of the most visually spectacular scenes, it is an example of Freddy’s psychological violence as much as his physical power. 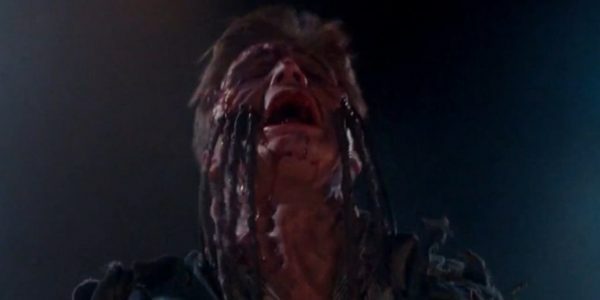 Dream Warriors was noteworthy for how it portrayed and contrasted the strengths and weaknesses of its main characters within the dream world. Taryn imagines herself as a punk rock action hero, and finds her inner strength in alternative badassery – combating Freddy and transcending her past struggles with drug abuse. In hospital she’s unable to express herself, but her dream self wears leather studded clothes and has a huge mohawk. This is the strong person Taryn and the audience wants her to be. But Freddy gives her a lethal overdose and confirms her worst fear – that she can never escape her mistakes, that she will always be a junkie. 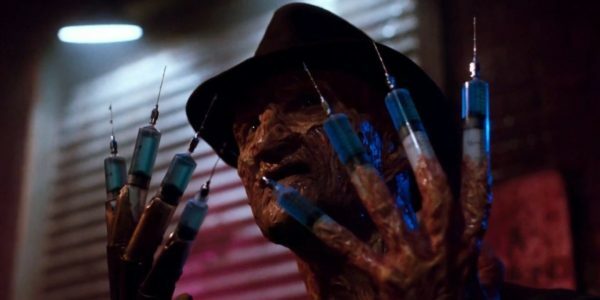 Replacing his finger-knives with syringes is a simple but effective choice relative to the other transformations he undergoes, as well as showing how easy it is for him to overpower one of the dream warriors (and my personal favourite of the bunch). Freddy’s absolute cruelty is what keeps his humour dark and fitting with the horror, which is why moments like “What a rush” are so chilling. Much like Taryn’s death, the killing of Debbie in The Dream Master is about the subversion of expectation and the ruthless mockery of her strengths. So much of Debbie’s on-screen time is spent reminding us of her physical strength and work-out routines, we come to expect them to be to her advantage later in the film. Not so much. Freddy pushes her weight down on her, snapping her forearms in the process. And in a sequence that is clearly reminiscent of The Fly (released two years before The Dream Master), insectoid legs sprout from her torso and her skin peels away, transforming her into a cockroach – one that Freddy promptly crushes. All her training amounted to nothing; he turns it against her then makes her feel entirely insignificant. It’s an excellent raising of the stakes as the potentially most capable member of the group is brutally dispatched with such ease. Jennifer was sent to Westin Hills Asylum for her suicidal behaviour. In reality, they were Freddy’s attacks on her, re-interpreted by parents and doctors with the presumption that they know best. The Elm Street series keeps its secondary characters in the realm of disbelief at first, and Jennifer’s self-inflicted cigarette burns and supposed self-harm is unfortunately recognisable as part of a troubled teen’s life. There are times when this is pushed, and Jennifer’s death is a prime example. A quiet, passive girl killing herself by smashing her head through a television screen is possible but the first big step into the weird for the nonbelievers. But the main reason for this being on the list is the impressive practical effects and creative design of Freddy emerging from the TV set. It’s one of the most immediate and shocking kills in the series, and – to put it plainly – awesome. Phillip, like his fellow committed friends, was placed in Westin Hills for suicidal behaviour. His hobby was to make marionettes, and is nicknamed “The Walker” for his sleepwalking habit. Both are traits that are ultimately used against him by Krueger. His tendons are torn from his arms and legs, and used as strings to puppeteer him like one of his marionette dolls, until he falls to his death. It’s definitely one of the most gruesome, painful-looking deaths in the series, and so memorable that it later served as inspiration for a fatality in Mortal Kombat X [linkhttps://www.youtube.com/watch?v=Gl9biIrTsL0]. In a cruel twist, due to his sleepwalking and supposed “suicidal tendencies”, Phillip dies desperately clinging to life – but is remembered by the world as the opposite. At number one is the first and most iconic kill of the series. It’s a statement of intent – we know that the harm done in the dream world has some effect on the real one by this point, but this shows the audience and Roy that this is no ordinary slasher movie. It’s openly supernatural in a way that can’t be explained in any other way, leaving Roy in an impossible situation. Who’s going to believe the rebellious boyfriend who freely brandishes a switchblade when he says his girlfriend was levitating in the air and killed by an invisible force? Speaking of which – the practical effects on display are astonishing even by today’s standards. It’s utterly convincing, as Tina struggles take her from the bed to the walls to the ceiling, leaving a trail of blood behind her. The whole set was rotating, and actress Amanda Wyss was simply told to “go with the room”. It may be one of the less visually complex deaths in the series, but it’s still my favourite – and an brilliant example of the powerlessness and abject fear that Freddy Krueger inspires in his victims.